I am writing to share some of my thoughts on this and to ask for your feedback. Northborough - Zinda Dilli! (Lively soul!) There is no better way of describing Rani Nautiyal, who passed away on January 24, 2017 at 91 years of age. She was never 91 years ‘old’ because if there was one thing she hated; it was being old! I n an installation ceremony on July 25th, The historic Rotary club of Worcester inducted Dr. Satya Mitra as its 102nd president . ISW member and Trustee Girish Navani is the CEO of eClinical Works, which makes clinical information systems software. The New York times recently sat down with Girish to talk about his management style. Hi, I’m Priya Rathnam, the reference librarian at the Shrewsbury Public Library. Most of you are probably familiar with the resources available at the library. If you are a resident of Shrewsbury, you can get a library card for free and then you can borrow books, music CDs, MP3-CDs, audio books, movies, video games, art work, discovery kits, and periodicals (magazines). You can also avail of the resources at all the libraries in the Central Mass region and can request materials from any of the libraries and then pick them up at SPL. Read more: Magical library card! 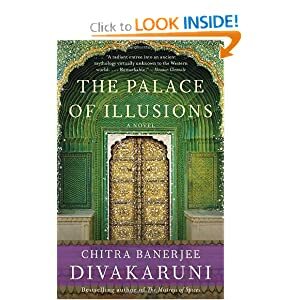 Book Review : Chitra Banerjee Divakaruni's "Palace of Illusions"
Draupadi is the narrator of this remarkable story and the author has infused her with a powerful, honest, introspective and humorous voice. Those familiar with the Indian epic Mahabharata will know that Draupadi is one of the central characters who plays an important role in the tale of the war of the clans to which the Pandavas and Kauravas belong. It is refreshing to see Draupadi's perspective and wonder with her if she could have done anything different to change the course of destiny. She experiences the gamut of human emotions from love and romantic desire to anger and the desire for vengeance and articulates them so distinctly that you empathize with her and can't condemn her. Kudos to Divakaruni for endowing Draupadi with a reflective and thoughtful side while also revealing her rash, spontaneous, vengeful, headstrong and passionate temperament. Bombay Diary - A Republic Day to Remember! The God of Small Things?